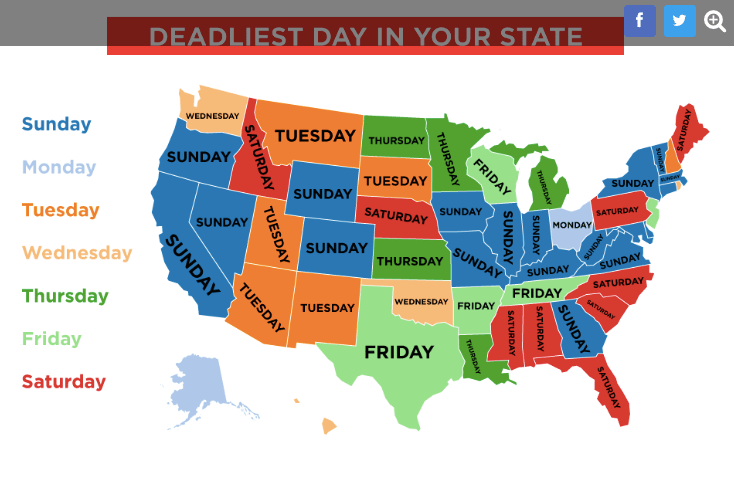 What’s the Deadliest Day of the Week in Your State for Gun Violence? You might think Monday would be the most likely day when miserable, unhinged people are most likely to go on a murderous gun rampage. But you’d be wrong. In 20 states, including California, Sunday is the deadliest day for gun violence. And in several Bible Belt states, Saturday is the worst. All in all, weekends, including Friday, are the times when Americans are most likely to get shot in 29 of the 50 states. This according to a recent story in Vocativ, which launched the investigation in response to model Chrissy Teigen’s tweet after the Canadian parliament shooting that active shootings were a “Wednesday” phenomenon. Sadly, this window was enough time for 2,200 gun deaths to occur, as well as another 7,800 shootings that were not fatal. Far too many, any day of the week. « Why Do Democrats Keep Trying to Ban Guns That Look Scary, Not the Guns That Kill the Most People?